Urban Sketchers Seattle: Urban Sketching on Our One Sunny Day, At Last! Urban Sketching on Our One Sunny Day, At Last! 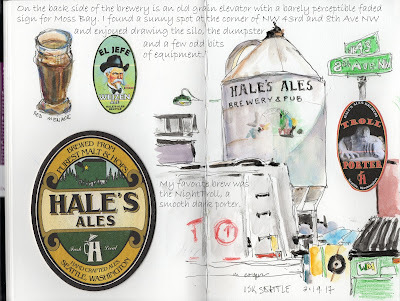 After all the recent rainfall, it was a beautifully sunny day at Hale’s Ales Brewery for the Urban Sketchers Seattle meet-up at 11 a.m. 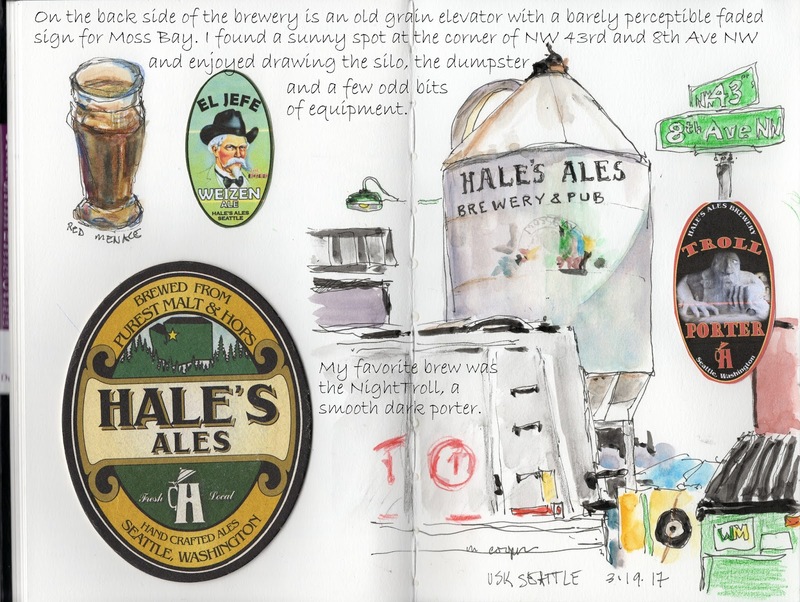 Since 1983, Hale’s claims to be the longest running, continually owned brewery, of any size, in the Pacific Northwest, and indeed one of the oldest in the entire U.S. There were fascinating things (like a red London phone booth) to sketch inside, but the forecast is for another week of rain and I didn't want to waste our one sunny day! 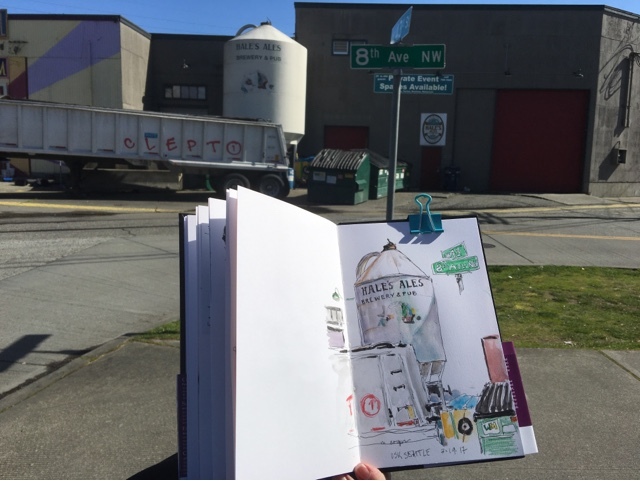 I found a great spot out back of the brewery at the corner of 8th Ave NW and NW 43rd. Who wouldn't want to bask in the warm sun while sketching a grain elevator with a worn out Moss Bay sign, a container with the word "clepto" spray painted in red on the side, a small spare tire secured with rope to the blue tarp on a storage bin and a nice big green dumpster? After a while, despite the sunshine, my hands did get cold so I went inside to see what the menu had to offer. I counted 23 sketchers today. I'm not surprised. When we get a sun break here in the Pacific NW we don't waste it! After sharing our sketches and getting a group photo in the Pub, I headed for one more spot on the way home. I've been waiting for a sunny day and some good cast shadows so that I could sketch the old Everett Courthouse. These shadows weren't quite what I had in mind, but we have only one day of pure sunshine before it rains again! The front steps are no longer used to enter the building and some of the landscaping is getting a bit overgrown. 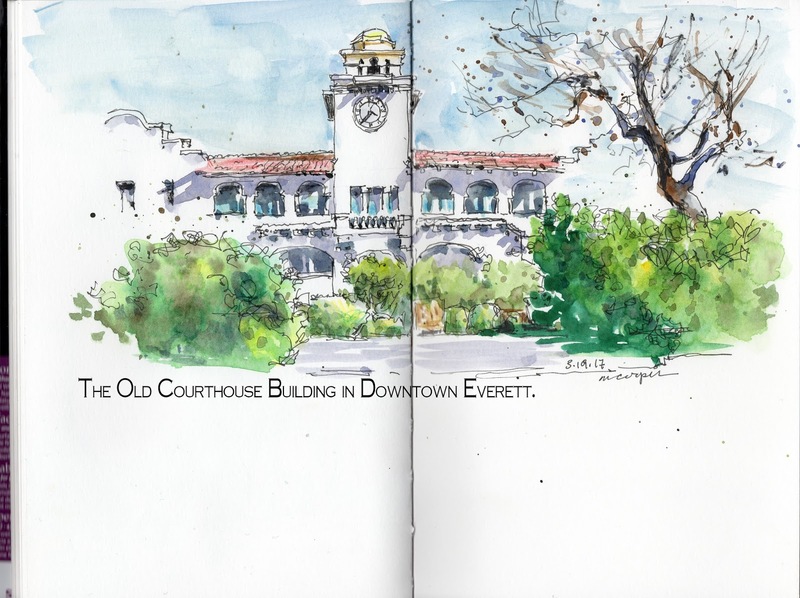 It's an unusual type of architecture for our area, but Everett does have a few random Spanish style buildings, including the old courthouse. The shadows I wanted would have been better in about an hour but I felt uncomfortable alone in the deserted neighborhood. So I quickly sketched an abbreviated version of the scene and went home to add color. This is a lovely sketch, Michele. I'm just seeing it.